As part of the Copenhagen Jazz Festival 2014, Mark Solborg and Herb Robertson played a freely improvised set at the Koncertkirken, an old church downtown. No doubt drawing on the shared language developed from past projects such as NOD, and inspired by the venue and its acoustics, the result is quietly intense, intimate yet hinting at infinity as the two instrument’s differing timbres dance in the broad acoustics of the venue. The open resonance of the space lends a significance to each note and phrase – there’s no place to hide here, and no need either. As a warm-up The Flute is indeed prayer-like, a gentle questioning. Robertson’s penny whistle is indeed flute-like, evoking zen campfires as Solborg’s guitar creates a sparse acoustic tapestry while simultaneously tugging at the threads. On I Know You Robertson switches to trumpet, beginning with a solo series of low muted self-talk, a conversation of one as Solborg’s bare tone alternatively supports, pushes back, and plays with subtle harshnesses. The ‘main performance’ starts with Hymn, easing us into the space with a sparse dialogue; guitar couplets ring out, penetrating drawn-out trumpet breaths. The title track starts with a yell. Robertson’s muted tones echo and reverberate as Solborg’s guitar takes on a koto-like sound before exploring more direct electronic textures. Robertson’s trumpet heads for the rafters in a mournful, folk-ish refrain. The landscape continues to twist and turn and put simply, it’s a 17-minute capsule masterclass of subtlety and egoless interplay. Slideswitch is a short, palate-cleansing burst of pointillistic electronic experimentation by Solborg and then we’re into the elegiac finale, Shout, Landscape and Goodbyes which is a perfectly descriptive title. Robertson’s tone becomes much more strident, throwing questions into the air, laying out a series of demands. 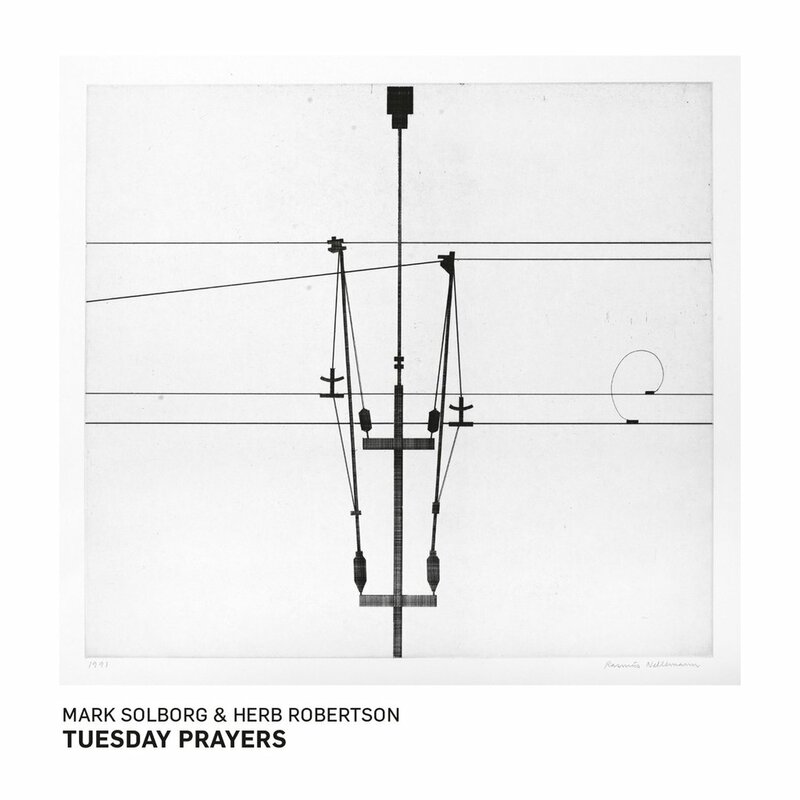 Solborg answers with angular, bell-like feedback and these two voices combine in a dense storm that resolves into a final passage of quiet and tranquil complexity. It’s powerful finish to this all-too-brief set. For a purely improvised performance, it is peculiarly perfect in its structure and impact. The short melodic fragments, juxtapositions, and anti-tunes weave and knit something deeply meditative, almost devotional in its aetheric conversation. In these ecclesiastical surroundings, it’s non-denominational but simply and definitively devotional. Whatever floats your spiritual boat, these minimalist prayers will raise you up. “Tuesday Prayers” is available directly from ILK Music.